Handsome man in a running braid! And a sweet forelock, too! - I have a childish love of his wavy fabio locks. There, I said it. In the end, I'm going to do what I want, and therefore I'm leaning toward leaving the mane. Even if I am getting peer pressure to pull it...but since when do Contender and I succumb to peer pressure? After all, his name is still Contender, right? Edit, so I don't get taken too seriously: I'm not agonizing over this at all, in fact, I find it hilarious. I find it funny that on one side, I have my trainer and my best friend Mary who would love it if I'd just pull it already (and clip his feathers too while I'm at it), and on the other you have me, who enjoys gleefully being a thorn in Mary's side as far as grooming is concerned. I'm highly entertained by all this, and am just curious what you all think! I feel bad that you are so torn. Breed standard allows for either pulled or natural mane, so no help there. As for CT's, I showed my Arab with a long mane. For the dressage phase I either did a running braid or a continental braid (a banding technique). Go with what you like. Hair grows that is a given. With that flaxen mane he will look great either way. But please don't shave his feathers. Cardi shows with his and so do friesens. Good luck. Oh Nicole, I am not torn about this at all. I really just find it funny, because my best friend Mary is a grooming nazy just like Heidi :). She's happiest when she's riding something that's a quick polish away from being able to enter the show ring! I love him with a pulled mane or a long mane. Heidi, that's too funny, you are just like Mary! She posted a picture of a well turned out hunter yesterday with a banged tail and the quarter mark and everything and was like "WHY DO YOU HAVE A PROBLEM WITH THIS?!" I just laughed and told her that she had better not ever buy a historically hairy breed! Nicole, Lisa thought Cardi showed with a pulled mane and button braids, but while I've seen him with something that looks like huge button braids, I'm not sure how exactly they do that. Do you know? Contender is so cute! He makes me want a pony even more. The mane thing definitely depends on your own personal preference. Personally, I dislike the upkeep of mane pulling so if I had a breed where it was acceptable to leave it long I totally would. Jen, I don't know for sure how they get those big buttons. I'm sure his mane is really thick. Play with it. There are some great braid books. As soon as I saw you put the question out there, I knew Lisa would say pull it. She has been wanting Comrades pulled. This is the best button braid tutorial I have ever seen. It starts with a pulled mane, but I would think that you could adapt the technique for a long mane. Braiding with the waxed thread is not essential if you don't want to wait to order it from Bit of Britain (the only place I could find it). I used yarn the first time I followed these directions and it worked just fine. This is part 2 of that series on Eventing Nation. Longtime reader and this drew me in to comment for the first time - keep the long mane! I have a little mustang, and he has a lovely long thick mane that I fully intend on keeping. It drives my trainer batty, but I have stood my ground for years now. It's distinctive, and if he can pull it off (which from your pictures, he can) there is no reason to pull it. You can easily leave his mane long! 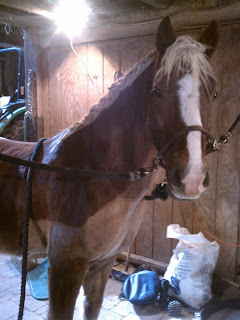 I have a Gypsy Vanner and I leave his and just do a running braid! We show dressage and will do some CT this summer! If I dont have to pull a mane there is no way im doing it, I hate it!